Ten days behind schedule, Michael Palin sets sail for Japan. Learn how to get top-notch skin care products for under $20! 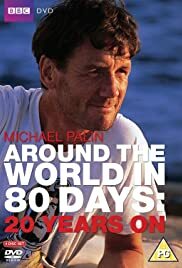 With 22 days to go, delays, misunderstandings and a bomb impede Michael Palin's journey. Michael Palin: So, this is Poona. Bit of a disappointment really. A fascinating look at the world through adventurer's eyes. Michael Palin manages to make us look at the world through a fascinating perspective. He talks about Philleas Fogg as though as if he was a real character that he's trying to catch up and in the meantime we share with him the joys and dangers of a journey that takes him from the battlefields of the Middle East, to the Purple Mountains of the American West. We can see how the world changes as people and places differ and we get a small taste of our wonderful and diverse world. Definitely a must see for anyone who enjoys travel.